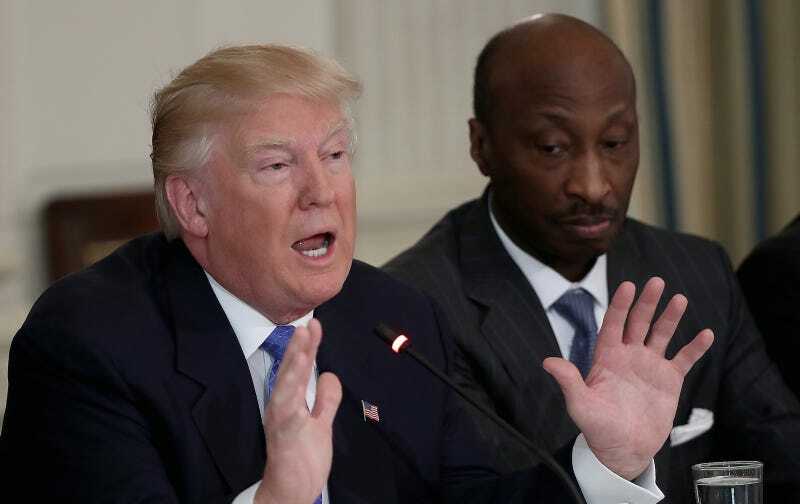 Merck & Company CEO Kenneth C. Frazier sits next to Donald Trump during a listening session with manufacturing CEOs in February 2017. Image via Getty. After the president failed to specifically denounce the white supremacist and Nazi ideologies responsible for the violence and terrorism in Charlottesville this weekend, Merck CEO Kenneth Frazier stepped down from Trump’s American Manufacturing Council on Monday. Trump, who directly benefits from white supremacist ideologies and the people who hold them, responded to this criticism not by finally giving in to pressure to disavow Nazis, but by bashing Frazier, who is black, on Twitter. “As CEO of Merck and as a matter of personal conscience, I feel a responsibility to take a stand against intolerance and extremism,” Frazier wrote in a statement on Monday morning. We condemn in the strongest possible terms this egregious display of hatred, bigotry and violence on many sides, on many sides. It’s been going on for a long time in our country. Not Donald Trump, not Barack Obama, this has been going on for a long, long time. It has no place in America. What is vital now is a swift restoration of law and order and the protection of innocent lives. No citizen should ever fear for their safety and security in our society. And no child should ever be afraid to go outside and play or be with their parents and have a good time. I just got off the phone with the governor of Virginia, Terry McAuliffe, and we agree that the hate and the division must stop, and must stop right now. We have to come together as Americans with love for our nation and true affection— really, I say this so strongly, true affection for each other. Our country is doing very well in so many ways. We have record — just absolute record employment. We have unemployment the lowest it’s been in almost 17 years. We have companies pouring into our country, Foxconn and car companies and so many others. They’re coming back to our country. We’re renegotiating trade deals to make them great for our country and great for the American worker. Before this presidency, it was rarely necessary to interrogate the space between shock and surprise. None of this is surprising behavior from a longtime racist and professional troll who enjoys broad political support from white extremists, but the radical fact of Trump’s power, and the horrible ways he chooses to wield it, will—and should—continue to slam us in the gut, over and over and over again.